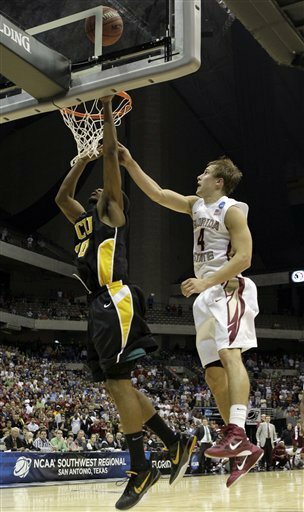 VCU (Rams, 23,483 students, Richmond, VA) 72, FLORIDA STATE 71 OT – Bradford Burgess made a layup off an inbounds pass with 7.1 seconds left and Rob Brandenburg blocked a shot at the buzzer, giving Virginia Commonwealth a victory over Florida State in overtime in a Southwest Region semifinal Friday night. On an inbounds play with 7.9 seconds left, Joey Rodriguez threw a nifty bounce pass between two Florida State defenders. Burgess caught it in the lane and went up before the defenders could recover. He banked it in, just to be safe. Ironic, as FSU is one of the premiere defensive teams in the country. 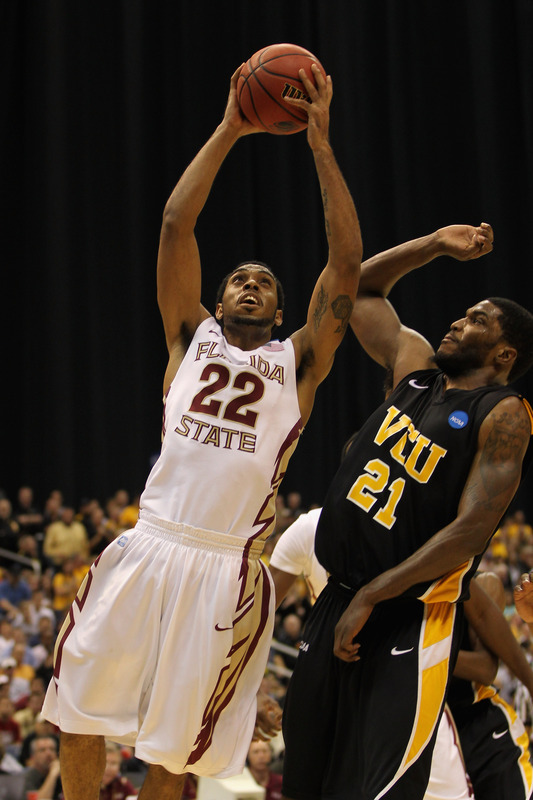 On Florida State's final possession, Derwin Kitchen drove the baseline and passed it outside. The shot may have been too late, but Brandenburg avoided any controversy by swatting it, sending the Rams (27-11) into the final eight for the first time. Kitchen scored 23 points to lead Florida State (23-11), which hadn't been this far since 1993. Chris Singleton - FSU's regular-season leader in scoring, rebounds and steals, and the ACC Defensive Player of the Year by league coaches - almost saved it. He made a tying 3-pointer with 45 seconds left in regulation and a go-ahead layup across the baseline with 29.2 seconds left in overtime. He finished with 16 points and nine rebounds, easily his best in three tournament games after missing five weeks with a broken and surgically repaired foot. Burgess led VCU as he's done all tournament, scoring 26 points. He was 6 of 7 on 3-pointers. His only miss was a blocked shot in overtime. Brandon Rozzell scored 16 points, including a series of 3-pointers during the second-half surge that put the Rams back in front - seemingly for good, until their collapse. Jamie Skeen scored 11 points and had eight rebounds. FSU allowed the lowest field-goal shooting percentage in the country this year, but VCU shredded that. Even with their late woes, the Rams made 45 percent of their shots and were 12 of 26 from behind the arc.